Infant mortality, literacy rate etc. Progress in the quality of life in a country. 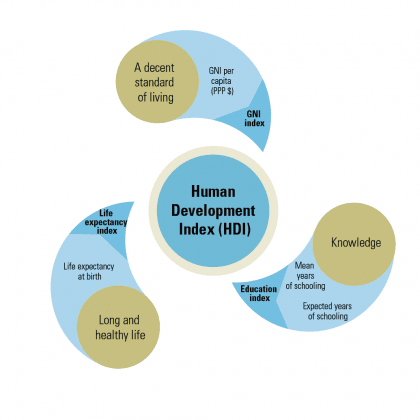 Human Development Index is used to measure Economic development. Economic growth is different from Economic development. Bhutan, a small Himalayan kingdom developed a new concept of assessing development in the early 1970s known as the Gross National Happiness (GNH). 1. Which of the following organisation publishes Human Development Index? 3. As per recent HDI report, what is the rank of India? 4. What is the present life expectancy in India as per HDI report? 5. Which of the following country measures Gross National Happiness Index?